Some of the best companies in the world, including Github, 37Signals, and Automattic, allow their employees to work from home. It’s pretty surprising to us that so few startups follow their lead. We’re a small organization ourselves (only two full-time employees), but we don’t require each other to be on site. We live in the same city, and we go to the office often enough, but there’s absolutely no obligation that we do so. It works for us. If Brad really needs to concentrate on something, he’ll stay home (or ask me to), put on the headphones, and get to work. I do the same thing. We’re actually sometimes more productive when we’re distributed. We thought we’d share some early stats from our anonymous job matching service to help make the case for remote work as a viable and even potentially superior alternative to on site work. Since we’re not in Silicon Valley ourselves, perhaps we have a unique perspective that can be hard to see from the inside looking out. Either way, our hope is that our conclusions will convince your team to at least consider making remote work an option. (Shameless Plug Warning) If, by chance, you do come to that conclusion, be sure to let us know. We’d be more than happy to help you fill out your team with amazing people. You can learn more about our service here. Oh, and developers can see the FAQ (and sign up) here. There is a “talent war” in Silicon Valley right now. Have you heard about it? Some of the side effects have been quite amazing. Aqui-hire has become a word most of us understand, developer salaries are higher than they’ve ever been, and perks and benefits offered by Silicon Valley startups are unheard of elsewhere. Another side effect is that, increasingly, developers are being lured to the valley from elsewhere. Several of the best from our hometown of Memphis have moved to San Francisco over the last couple years, and the same can be said of just about every larger southern or mid-western city in the US. Still, for some, Silicon Valley is a difficult place to be. There are a large number of individuals who, for family or other reasons, simply can’t make the move. There are even more who choose not to. This is especially true for families. 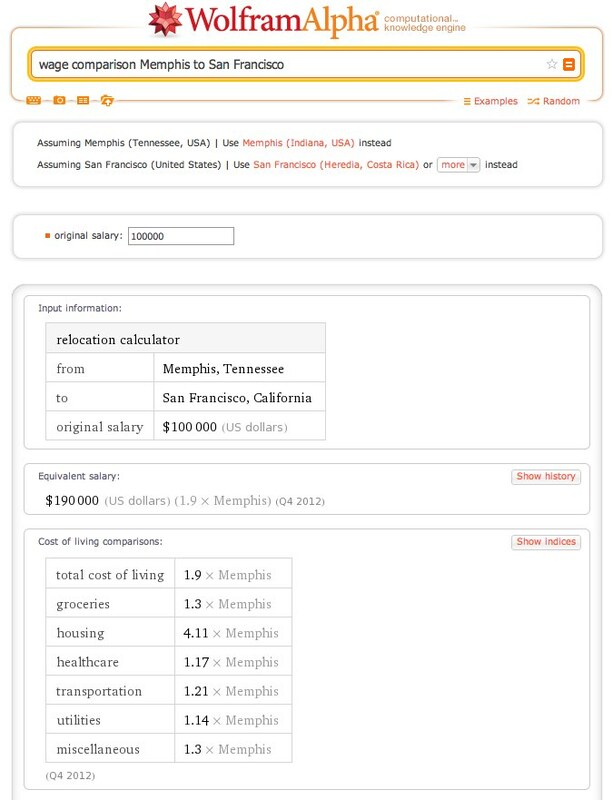 According to Wolfram Alpha, you’d need to almost double (1.9x) your Memphis salary to live similarly in San Francisco (source). That may be possible for a developer moving to the area, but can the same be said for a spouse in a different field? Silicon Valley is an amazing place for a 20-something single person. Perhaps not so much for a 30-something person with a young family. So far, nearly 200 developers have signed up for our anonymous job matching service. A fair number are in Silicon Valley and other tech hubs (primarily NY), but certainly not the majority. We use their Work for Pie scores as an approximate measure of coding chops. The score is primarily based on open source contributions, and is far from perfect, but it’s better than most of the other options out there, so for now we’ll go with it. When they sign up, we ask developers a series of questions in order to better understand what they care about and what kind of career options they’d like to entertain. We ask them if they’d prefer to work remotely, and we also ask how important their answer is, relative to their other preferences. The average Work for Pie score for the entire community* (thousands of developers) is 38.2. Our community boasts some of the very best and most prolific open source contributors from all over the world. 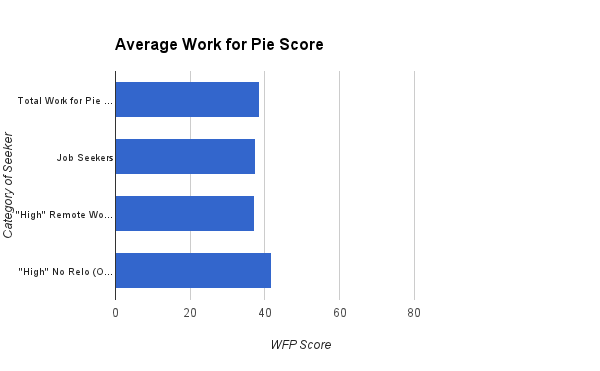 WFP scores in the mid-twenties and up represent significant meaningful participation in communities like Github, Bitbucket, Stack Overflow, and (to a much lesser extent) Hacker News. Now, the average WFP score of the nearly 200 developers who have opted in to our job matching service is 37.4 with a range from 1 to 93. That’s a bit lower than the community as a whole, but probably statistically insignificant. The average WFP score of those individuals who highly prefer remote work is 37.3, so almost the same, with a range from 1 to 86. There are clearly quite a few highly skilled developers who prefer a distributed team. Finally, the average WFP score of those individuals not in Silicon Valley and to whom relocation is not an option is 41.8, with a range from 1 to 93. Clearly, there are some excellent developers who aren’t in Silicon Valley. The whole point of this exercise isn’t to say that developers outside of Silicon Valley are better than developers who live there. That’s ridiculous and undoubtedly false. The point of this exercise is to say that there are a lot of really great developers who live outside the valley and don’t have any desire to be there. If you’re goal is to build an amazing team, it might be worth your time to look elsewhere. We ask our job seekers their desired salary, and the illogical but not surprising truth is that most list desired salary as some function of their current salary. If they’re in TN, where avg. salary tops out at maybe $100k, they’ll often list something in that range. If they’re in San Francisco, where average salary is considerably higher, the desired salary follows suit. The point is this: most people know that locating from most any place to San Francisco is going to require a huge pay boost for the economics to make sense. Someone making $100k in Memphis would need to make $190k in SF to live the same way. That fact alone convinces many to remove SF from the list of cities to consider, no matter the salary. But, a Silicon Valley salary level is pretty unheard of here in Memphis. Offer that kind of money to almost anyone here, and the chances that you’ll lure them away from whatever they’re doing now are fairly high. Throw in the fact that you’ll save money on space and catered lunches and all the other Silicon Valley perks and the economics make even more sense. Money isn’t everything, but a pay boost of $20k or more is enough to make a majority of folks at least hear you out. We’ve seen it happen time and again with many an awesome developer who can’t or won’t relocate. Github, from what I can tell, uses this exact strategy to great effect. Find the top Rails developer in nearly every small city in the US, and the chances that he or she works for Github are pretty darn high. There is a lot of talk about great developers being 10x more productive than just average ones. I’m not sure I buy all that, but it definitely helps to have a great team. Isn’t the chance at hiring someone great worth some of the inconveniences (of which there are few) of a distributed team? Github thinks so. Remote work is not for everyone. There are several studies that show that on site teams are more productive than distributed teams. But, if you have the chance to hire an amazing developer in Kansas for the same price as an average one in Silicon Valley, doesn’t the extra productivity from that hire make up for the potential drop due to having a distributed team? Our argument is that yes, it does. It should be something your team considers. If you’re struggling to hire, or if you can’t pay market rates with your seed money, or if you care more about building an amazing team than about having them on site, then it’s something you should consider. It’s easier than ever these days.